Felicity Defined: Now, THIS is Love! 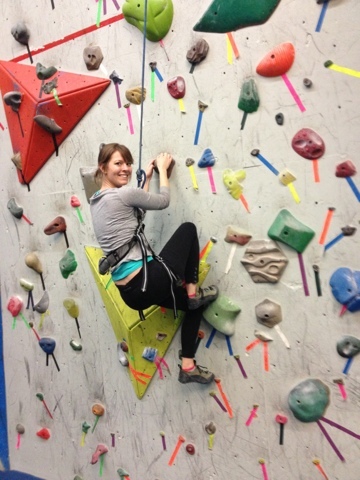 My Valentine's Day surprise was a day of indoor rock climbing at Climb Time Indy in Castleton then dinner and drinks. It was perfect! My husband definitely knows the way to my heart! This was our first time at Climb Time, and I have to say it was more challenging than I thought it would be. We got all geared up in our climbing shoes and harnesses and dove right into it! We climbed for about 2 hours - I guarantee I'm sore tomorrow! We had a lot of fun laughing with each other as we attempted every wall. Aaron was definitely the better climber though I was not too shabby! I had a bit more faith in the harness and rope then Aaron did, so I was able to be a bit riskier in my climbing. 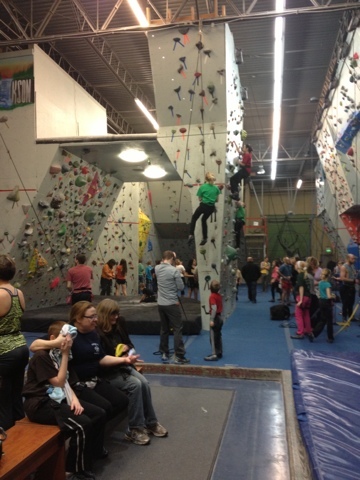 Climb Time is a decent-sized facility with climbing areas for a range of expertise. We were able to climb as we wanted to without having to wait in a long line. We scored a Groupon for 3 climbs for $20 - so the price was definitely right - but even if we had to pay full price, the price isn't too bad. Trying out this new activity for V-Day proved to be a great date - add on our delicious dinner at Applebee's (the location of our first ever date), and I am one happy girl! ... oh wait, I forgot to mention the heavenly Flying Cupcakes that my Valentine gave me to fulfill my sweet tooth - red velvet with choc chips and choc with strawberry filling ... YOU HAVE GOT TO TRY THE FLYING CUPCAKE (if you haven't already!). This looks like fun! Maybe a seester workout day? I loved it but believe Mel wasn't as keen on it ... I'm up for making a day of it!